The WGPO is proud to announce its inaugural championship, the WGPO Word Cup, which will be held July 1-6, 2011, at the Grand Sierra Resort in Reno, Nevada. The tournaments are being organized by Jeff Widergren and the WGPO, and will be directed by Rick Wong and Larry Rand. An 8 game Open Early Bird, “The Preamble,” will take place Friday, July 1st. The Premier Event will feature three divisions, each playing 35 games, July 2nd-6th. The Grand Sierra has attractive room rates for our group, starting at only $66/night. You must register with the group code (SCS11) or using the WGPO Reservation link to receive a $40 refund at registration. Maximum two refunds per room. A $25 refund will also be given to players who postmark their payment by Saturday, April 2nd. The entry fee for the Preamble is $45. The entry fee for all three divisions in the Premier Event is $140. Unlimited play ups are permitted. Your current recognized rating on 6/30/11 will be used for qualification into restricted divisions. WGPO ratings take precedence. A flier and entry form are currently available at this link. A list of entrants, under “upcoming tournaments” is being maintained at the website for all events. If you plan on attending, please reply to larryrand@cox.net and let me know if you plan to play in the “Preamble” and/or the Premier Event. As everyone is paying the same Premier Event entry fee, players WILL have the option of changing divisions anytime without penalty until 10PM, Friday, July, 1st. The Reno 2011 Martin Luther King tournament, held in January, returned 117% of all entry fees to the players in rebates and prizes thanks to the Grand Sierra’s contribution to the prize fund. The 2011 WGPO Word Cup will not disappoint you! Come celebrate the Fourth of July weekend and the Red, White and Blue! Attendees: Stephanie Steele, Keith Hagel, Peggy Grant, Steve Pellinen, Rick Wong, Laurie Cohen, Janice Kaye (nonvoting), Larry Rand (nonvoting), Melissa Brown (nonvoting). The duties of the EC and BPR are outlined in the WGPO Bylaws. EC shall be responsible for “day to day” operations and decisions, while the BPR shall be responsible for setting policy, either brought to it from the EC or from the players at large; this may or may not necessitate member input / vote of the players depending on the issue. Keith suggested that WGPO maintain a policy manual documenting the policy decisions. Peggy suggested that the BPR split up the members for representation, somewhat based on geography, but not solely. With discussion, Peggy agreed to take the membership roster and study how it could be distributed, and make a proposal back to the EC/BPR. Schedule: Friday, July 1st: 8-game Early Bird. Saturday, July 2nd through Wednesday, July 6th: 35 games, 3 divisions. Entry fees will not be as disparate as in January, which was $150/$75. Would like something more in the range of $125/$100/$100. Discussion around having three divisions: Division 3 with a maximum rating of 1199, Division 2 with ratings above 1200 (the group did not reach agreement on whether the cutoff for division 2 should be 1600, 1650, or 1700) and an Expert Division; there will be unlimited play-up to both Division 2 and the Expert Division. Distribution of entry fee money to winners of the respective divisions was discussed, but conclusion not reached. A Word Cup Committee will be formed to continue discussing and to finalize the details of the event, at Keith’s suggestion, with Rick agreeing. Larry Rand would like the group to consider awarding prize cups in memory of the late Al and Vicky DeMers, to be sponsored by their daughter Sheryl DeMers. This will be decided by the EC. WGPO Clubs: Currently, clubs are listed on the WGPO website under the title designated by individual club directors. Mary Rhoades has stated to Carol Dustin, Chair of WGPO Clubs Committee, that any NASPA club advertised on the WGPO website must include the official NASPA designation. Stephanie proposed a motion that the listing of clubs on the WGPO website shall not include the NASPA designation in the club name. Motion was seconded by Keith, with suggestion of including a footnote that clubs are sponsored by other organizations. Failed 2-3-1 (Steph and Keith for; Rick, Peggy and Steve against; Laurie abstained). Rick proposed a motion that that club directors should decide how they want their club listed on the WGPO site. Passed 5-1 (Steph, Rick, Peggy, Laurie and Steve for; Keith against). It was agreed that the club page would list at the top that these are WGPO clubs, some of which may be affiliated with other organizations as well. Peggy suggested a recruitment incentive for directors for running clubs and tourneys, and proposed that “free entry” to a WGPO tourney be considered. The EC/ BPR supported idea of incentives, and Rick suggested that Word Cup entry would be a good place to consider due to anticipated size of the tourney to support waived tourney registration for qualifying directors. Peggy will work on those details and get approval from BPR and EC. Peggy continues to work on the WGPO director’s test, and will coordinate with Susi T. as the WGPO rules are developed/ condensed for implementation. Peggy suggested that there should be a designated person who acts as WGPO liaison with NASPA. Group discussed and concluded that such a liaison is not currently needed. Posting WGPO announcements on CGP was discussed. It was concluded that the policy on interfacing with other organizations will be similar to the previous informal policy. Also, any formal dialogue will be directed simultaneously and in writing/email to the three members of the EC. Outreach and Publicity: Rick proposed a motion that WGPO form a committee to handle outreach and publicity. Motion seconded and passed unanimously. Peggy Grant will lead this effort. Web development: Keith and Rick will discuss offline. Incorporation: The issue of incorporation of WGPO will be researched by Steve for presentation and discussion at a later date. It was agreed that Steve will lead a committee on the research. Conclusion: It was suggested that another meeting be held and documented in Reno at Word Cup 2011, and any other tourney at which we have a quorum of EC/BPR (which would be at least 2 of EC and 3 of BPR; would consider use of electronic devices to make quorum in needed). Volunteers are needed to work on the Rules Committee, chaired by Susi Tiekert. The goal of the Rules Committee at this time is to simplify and clarify the existing NSA/NASPA rulebook in order to create a WGPO rulebook. If you are interested in working on the Rules Committee, please contact Susi Tiekert. The Nominations and Elections Committee has reviewed the election results, and unanimously agreed to certify them as posted. We congratulate all of the candidates for their participation and their high standard of campaigning, and look forward to a productive period for the next two years. 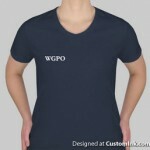 WGPO T-shirts will be available for purchase in the February Phoenix tournament. I have limited sizes, so if you are interested in reserving a shirt, email your size. The shirt pictured is the women’s style. 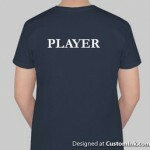 The men’s t-shirt is the same, but in a standard crew-neck style. Shirts are navy with white lettering. Shirts are $20 each, with all proceeds going to the WGPO.